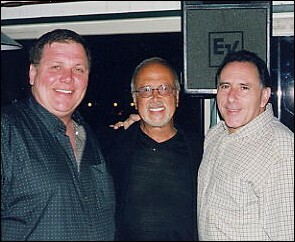 Bruce Bruno (center) in New Rochelle, N.Y., April, 2000, with friends Joe Lore (left) and Richie Giacco. Photo by Doreen Kelly. Bruce Bruno originally hooked up with Ronnie Hawkins and the Hawks in 1960 or 61, when he was recording on Roulette Records and Hawkins heard him. According to Bruno, Hawkins said, "Hey boy, how about coming with me and singing some of those ballads?" So he did. Later, in 1963, Bruno often was a warm-up act and occasionally, when Hawkins did not show up for their concerts, lead singer with the Hawks. After the Band's breakup from Ronnie Hawkins in 1963 and up until the summer of 1964, Bruno did a few shows as frontman for the group. In that period they performed as Levon and the Hawks and sometimes under the name the Canadian Squires. Bruce Bruno has a great singing voice and was still performing in the spring of 2000. He also teaches computer classes at the local New Rochelle High School, and maintains his friendship with Levon Helm and Ronnie Hawkins.